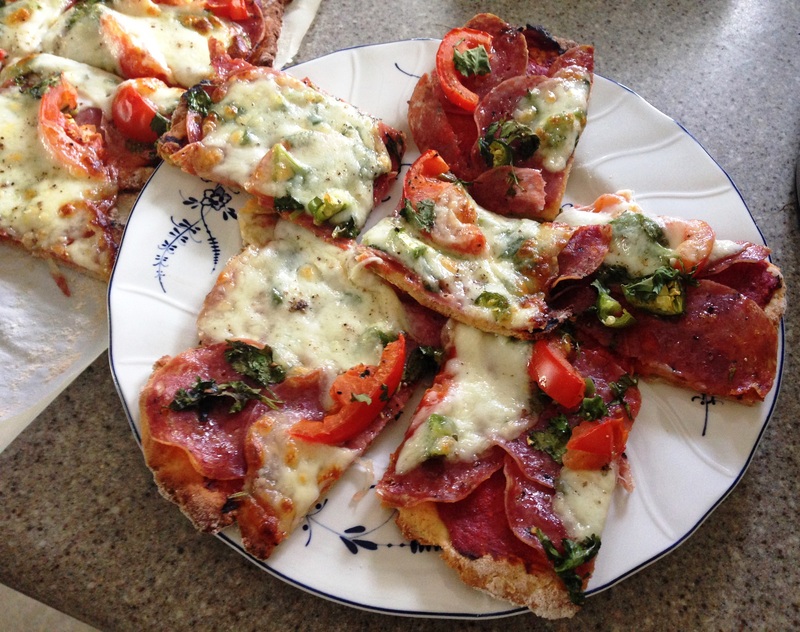 As you know, we always mix our own ingredients to make a dish, but we thought that this time, we would show you a gluten-free pizza recipe that you can make quickly and easily have access to pretty much throughout the U.S. 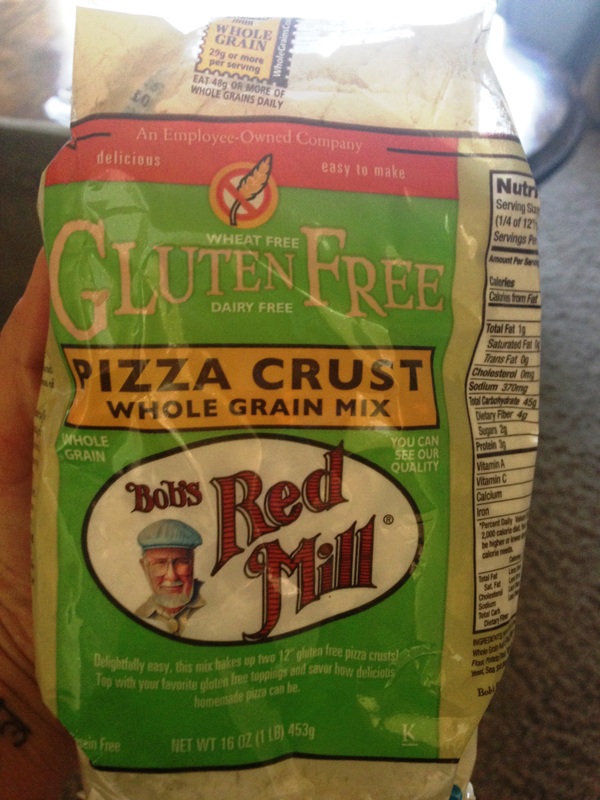 It is not always easy to find all the right flours required to make your gluten-free pizza, so we are introducing Bob’s Red Mill to you for our rendition. 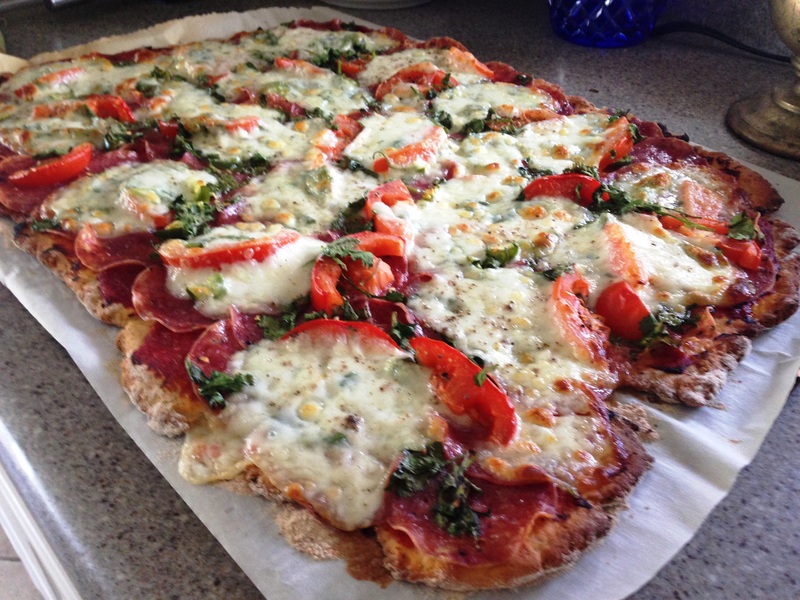 This recipe makes two 12 inch pizzas or one 20 x 14 inch large square pizza. Preheat oven to 425F – we use the convection setting. Heat the water to very warm and allow the yeast to open, let this sit for a minute or two. If you have a Kitchen Aid or the like use it with the dough attachment, otherwise mix the following ingredients together with your hands. Your hand mixer will not do well with this dough as it will be too hard for it. In your Kitchen Aid or with your hands, mix the pizza crust mix, eggs, olive oil, water and yeast together until your dough becomes silky and smooth. Place two overlapping sheets of plastic wrap on the kitchen counter and place the dough in the middle. Sprinkle a little of the left over flour on your hands and form the dough into a ball, wrap in the plastic and allow it to sit for 20 – 30 minutes. If you like you can also pre-make this dough and make it the next day. Take a big sheet of parchment paper and lightly sprinkle it with some left over flour and distribute evenly. Place dough onto paper and gently begin to push it apart in all directions. Use a little more flour on top of dough and begin to roll out from center to edges, middles and continue until your dough is nice and flat and reaches into all four corners of your sheet (or 12 inch round pizzas). Slowly slide the paper onto the baking sheet and place in the oven for 10 15 minutes or until slightly golden. Remove from the oven and set aside. If you are ready to begin topping then sprinkle hot pizza crust with the 2 tbsp olive oil listed in the ingredients below and begin our instructions. Now that you have your pizza dough golden brown and have drizzled your olive oil on top, spread the oil out a bit more evenly and then spread the all the tomato paste on top of your pizza with a spatula, evenly. Begin topping with the salami, one row at a time, salami should be almost touching corners. Now add the sliced tomato and then add the beautiful mozzarella which does not need to touch corners as the cheese will melt quite evenly. Finally add the basil, but please remove the stems, use only the leaves and add cracked pepper to taste. 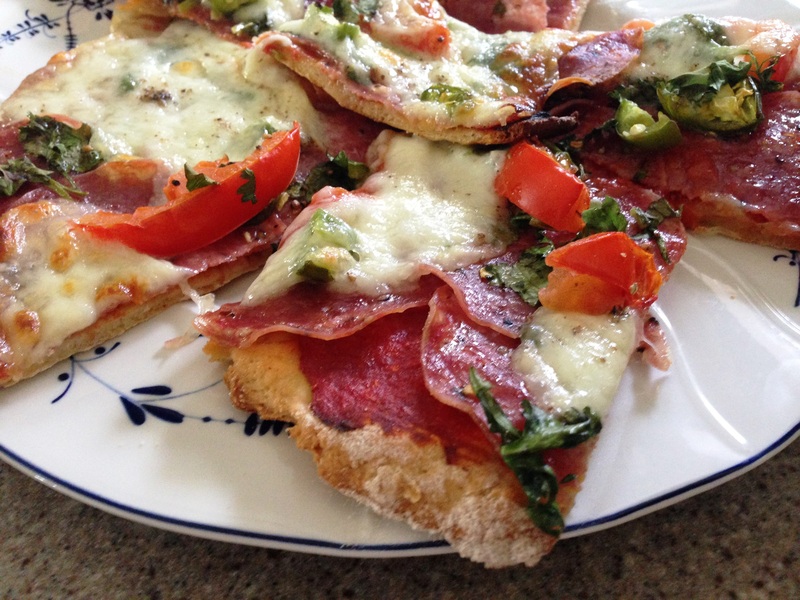 Bake this tasty pizza for 20 to 30 minutes on 425F convection, check after 20 minutes to see the consistency of the cheese and if the edges are crispy, careful not to over cook it. When ready pull it out, let it sit for 2 minutes and cut into your favorite squares with your pizza wheel. This pizza will not disappoint and will receive praise from your family and friends. If you like this pizza, try it out with different toppings of your choice. Cooking time is about 40 minutes total, so it’s great for dinner, or a wonderful Sunday afternoon get together.